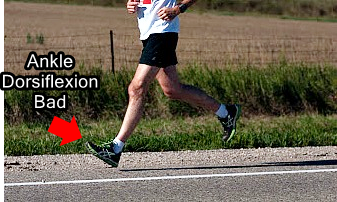 What is Ankle Dorsiflexion and How Can it Harm Runners? In running, ankle dorsiflexion at touchdown means the forefoot lifts up just before the foot strikes the ground. In this position, the heel is more likely to contact the ground before the forefoot, shown below. All heel strike runners consistently show ankle dorsiflexion at touchdown, suggesting that performing the opposite –ankle plantar flexion–acts as a deterrent from heel striking, allowing for a more anterior foot strike. For example, barefoot runners land with less impact because they don’t heel strike due to having a more controlled dorsiflexed ankle as compared with shod runners. Plantar Fasciitis – Constantly lifting the forefoot, repetitively stretches the plantar fascia. Anterior Compartment Pain – Shin splints is one of the most common injury heel strike runners suffer from. Achilles Overuse Injury – Dorsiflexion of the ankle at each step increases the range of motion of the ankle, which is not always a good thing for the Achilles tendon. Compartmental Syndrome – Researchers have linked repetitive dorsiflexion at touchdown with high intramuscular pressure of the lower leg. Tarsal Tunnel Syndrome – Dorsiflexion upon touchdown overtime may compress the posterior tibial nerve. Medial Calf Pain – Dorsiflexed ankle is a classic trait implicated in medial calf soreness. What Causes Ankle Dorsiflexion at Touchdown? Generally speaking, natural selection favored humans to execute ankle plantar flexion, not dorsiflexion at touchdown because doing so facilitates a forefoot strike which relieves pressure from the heel and the knee. For injury free running, ankle plantar flexion is best because it allows you to slide into your forefoot strike, whereas ankle dorsiflexion causes abrupt braking with the heel. P.S. Don’t forget to check out the Run Forefoot Facebook Page, it’s a great place to ask questions about forefoot running, barefoot running, and footwear. I’ll be happy to answer them for ya!